Like Family | TL Motors Inc.
TL Motors offers many services including periodic or scheduled maintenance, tuneups, transmission work, exhaust system repair and much more. Sometimes old-fashioned customer service can outshine even the biggest of brand names. Covina South Hills Kiwanis President (2015-2016), Carson Brian, runs TL Motors under this philosophy. He and his two brothers, Sean and Michael, have owned the auto repair service at 132 E. Front St. in Covina since 1978. They continued the business after their father and uncles retired. Carson said business is good, but it’s taken a lot of work over the years to build the strong trust their clients have in them. “It’s very hard to actually gain someone’s trust,” he said. “But once you do, they start believing in you, and they start believing in your company. Every month clients of TL Motors receive an email with care tips for their cars. The message includes pointers on simple upkeep of their vehicles and even how to prepare them for dramatic shifts in weather. Carson said the reason customers come back is because mechanics at the auto shop have a genuine care for the well being of their clients. Client Cesar Pina has serviced his cars with the business for more than 30 years and has a solid trust in the Brians’ work. The brothers even caught a problem with his car battery that the BMW dealership overlooked, he said. Both Pina’s daughters and his son also use TL Motors. 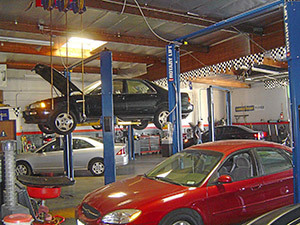 The shop was originally located in West Covina and moved to Covina in 2009 for a better location. The relocation didn’t hinder business much, Carson said. The company has history. The shop provides many auto repair services including periodic or scheduled maintenance, tune-ups, transmission work, exhaust system repair and much more. They also offer auto-detailing services. Sean Brian enjoys working on the cars and is invested in the work for a couple of reasons. Carson said above all, they want to keep drivers safe on the road. To ensure this, the brothers even encourage clients to come in before a road trip for a free check up. For more information on TL Motors, visit tlmotors.com or call 626-331-3511.